A slew of live performances will be taking place before the closing of the 2018 Winter Paralympics. K-pop performances featuring B1A4, BTOB, Samuel and others are to start Thursday at 5 p.m. at Gangneung-Wonju National University. On Saturday, the day before the closing of the Paralympic Games, an electronic dance music festival led by DJ Glory will be held at Yongpyong Resort for some 500 people. The festival will include chicken-and-beer parties. 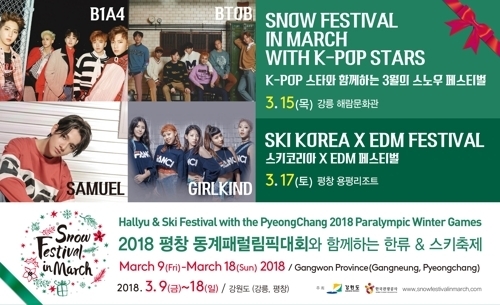 The events are part of the “Snow Festival in March” arranged by the Korea Tourism Organization and Gangwon Province, the host region of the PyeongChang Olympic and Paralympic Games. The festival kicked off with a two-day fan meeting by actor Jang Keun-suk at an ice hockey event in Gangneung from March 9-10. Actor Lee Dong-wook, an ambassador for the 2018 PyeongChang Olympic and Paralympic Games, also watched an ice hockey game with fans on Tuesday as part of the festival.